This week's new release at ELEMENTAL JEWELRY is Amazon Silver. That's right--it's the same necklace & earring set as last week, only in silver--due to numerous customer requests. Gotta keep those folks happy! There are the same teardrop shaped, texture-changing Jasper stones in vivid shades of Red, Blue, Green, or Orange. 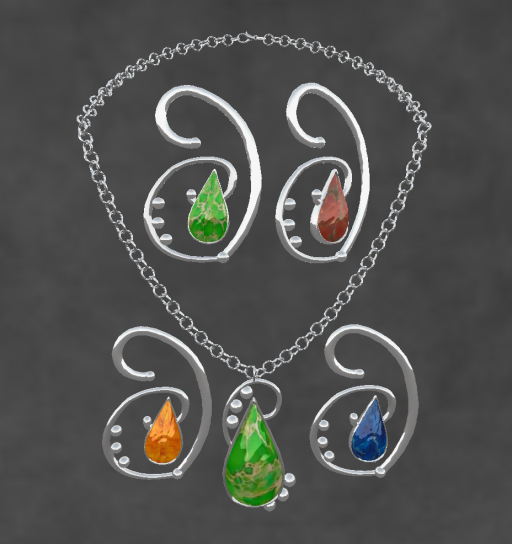 And...ELEMENTAL JEWELRY has just been accepted into the L.O.W. Sale Group. The letter of the week is...A! How timely! So, both the Amazon Gold and Amazon Silver jewelry sets are on sale for 60% OFF the ALREADY LOW INTRODUCTORY PRICE! You heard it--you can have either set for a mere L$60. Hair: Truth Hair LuLu in sahara. Destined to be a favorite! Skin: Essences Alma 01 in nougat. Beautiful!